We’ve all seen great ads that stuck in our minds because they had a touch (or a bagful) of humor in them. Who can forget the kid in the Darth Vader costume who “starts” his dad’s Passat using The Force? 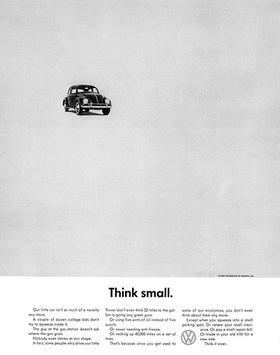 Or (if you’re old enough) VW’s fantastic “Think Small” campaign, arguably one of the most successful print advertising campaigns of all time. Betty White as the Little Footballer Who Couldn’t still makes me chuckle, and if I were into candy I’d probably buy a Snickers bar just for that. …and no trade show keynote speech is complete without its leavening of humor. Humorless presenters (I’ll spare you a link) are boring, no matter what they have to say. Humor can also create the exact opposite of its intended effect (or just none at all). Remember the TaxACT ad from the 2012 Super Bowl? So what makes humor an effective tool in marketing? What makes it work sometimes, and why does it sometimes fail? The answers are not complicated. People tend to trust a company or a person that is self-confident, but hate one that’s arrogant. Well, nothing says “confident” like a light-hearted attitude, and I’ve yet to meet an arrogant person who could laugh at himself. The (in)famous E*Trade baby ads poked fun at themselves, and remain some of the most memorable ads from the big game. (Even if you thought they were creepy, you still remember them. Admit it.) This ad for WMF both gets the point across and has a leavening of humorous exagerration that sticks in the mind. Any ad, print or web or television, has to be about the product, and humor in an ad has to be relevant to the product and its positioning. The problem with VW’s Darth Vader ad, as memorable as it is, was that most people surveyed remembered the kid, but not who the ad was for. 95% of the ad is about the kid. The car is only on screen for a few seconds, the company name even less. The GoDaddy ads with Danica Patrick were sometimes fun, and put GoDaddy in your mind. Some of them. Others? Not so much. In the 2014 ad, not only was she all but unrecognizable in that muscle suit (which has a serious creep factor all its own), but the message was completely lost. In fact, unless you’re extremely alert at the very end of the video, the only way you’ll find out what this ad was about is to go to GoDaddy’s YouTube channel, where it’s explained in the notes. So, humor works if it’s relevant to the product and its positioning, and if it’s in good enough taste that it doesn’t actually creep out the majority of viewers. Here’s to the imaginative ad designers who spend their clients’ hard-earned cash keeping us entertained. Let’s hope, for the clients’ sake, they keep these points in mind. Great Positioning? — Just Do It! I believe Carlton draught Big Ad was one of the early, purely viral ads. Remember, this was just around grand, epic films like Lord of the rings. I still think it is funny. The choice of Carmina Burana, the dramatic scenery, and the kind of honesty in the text.. it still works, it still makes me smile. Really great data, enjoyed this very much!